During the holy month of Ramadan, Muslims fast from dawn to dusk, which means not eating anything for more than 10 hours, depending on the season when the holy month occurs. Due to the long hours of hunger, it is always a good idea to include foods that help overcome hunger and thirst. Professor Oğuz Özyaral spoke to Anadolu Agency (AA) and said that tomato juice helps fasters feel full longer and keep their health on track during Ramadan. "Tomato juice is the most nutritious form of fruit, and it has many health benefits. It contains antioxidants that prevent countless diseases including cancer. Besides, it helps people to feel full for up to eight hours. 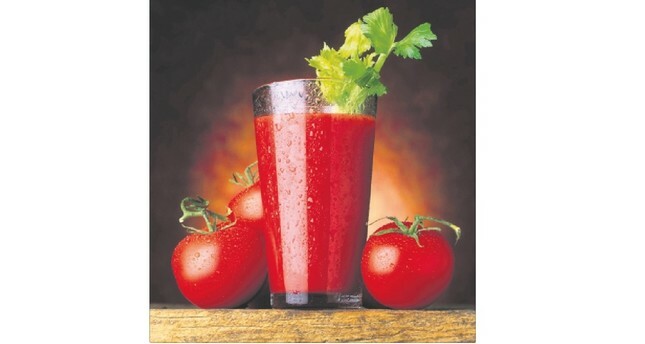 Drinking tomato juice during sahur - the predawn meal - is always a good choice," Professor Özyaral added. Although the juice of the tomato can be drunk on its own, it is also possible to make it more delicious and nutritious. Chop six tomatoes, two celery stalks, one onion, six cloves of garlic and one sweet and one hot pepper. Put them into the mixer and add two tablespoons of sugar and one tablespoon of salt and blend thoroughly. Later, put the mixture into a saucepan, add a little water and boil. Once it boils, wait for it to cool and blend it again until every little piece of the mixture disappears. Bon appetite!